Dec 21, 2016: Monitor Mount advice needed and appreciated! Dec 23, 2016: Is this a good vesa mount for my monitors? Jan 31, 2017: Another similar sized 27" monitor to pair with the Dell s2716dg on a monitor mount? Mar 06, 2017: I'm looking for a dual monitor mount, it needs to be able to hold 2 monitors and be able to mount to the desk with a clamp. The desk is curved and there is not an option to mount to the wall because it's an old basement wall behind the setup. I need help looking for one. Can someone link one to me? Mar 26, 2017: It's not finished, but I'm happy for now. Apr 07, 2017: How do I determine whether a monitor (acer xF240H) is compatible with a certain VESA mount? Apr 10, 2017: I put a heat lamp over my desk so she could enjoy the Unicomp with me. Apr 19, 2017: Dual Monitor Mount Possible with IKEA Fredde Desk? Jun 05, 2017: Our triple battlestation office. Jun 26, 2017: Do you swap monitors depending on your use cases? Jul 02, 2017: Anyone have experience with this monitor (Acer R240HY) and VESA mounting it? Jul 21, 2017: Anyone have experience with this monitor stand? Aug 15, 2017: Ascension x 144! 34UC79G Todo: Top mount the secondary. Aug 28, 2017: Secure a 1/2'' pole to a 1'' pole? Which hardware? Dec 15, 2017: Gdje kupiti monitor stand? Jan 19, 2018: Are the VIVO dual monitor stands any good? Jan 22, 2018: Need opinions on hotas mounts. Jan 22, 2018: Does your monitor arm raise the monitor up enough? Jan 28, 2018: Monitor Mount to Mount a thing? Feb 04, 2018: First time posting - my cozy setup. Be gentle. Feb 17, 2018: First time setup dual monitors. Benq xl2420t and GTX 760. Mar 06, 2018: This sub motivated me to build my first Battlestation and helped me get through a tough period in my life. Thank you everyone! Mar 09, 2018: What can you spend money on to improve your life as an engineer? Mar 31, 2018: Ended up choosing Vertdesk v3. Quick review for any others looking for info on it. Apr 13, 2018: Triple monitor mount for a "1 over 2" config? May 01, 2018: Just rearranged the setup. Running 3 Oculus sensors makes the cable management an even bigger challenge. Jun 20, 2018: Need advice on buying a second monitor and two arm mount. Have a HP 23es which requires a ~$25 VESA adapter to mount. Should I buy another 23es (or a cheaper 23er) and adapters and a mount, or just go for another pair of budget 23 inch monitors and skip the adapters? Aug 10, 2018: First post here :) thought I would like to no longer be a read only member. Oct 28, 2018: [Peripherals] Are there any available mount/mount adapter combinations available? Nov 13, 2018: Recently build a new rig and am wanting to upgrade my displays. Looking for advice. Dec 22, 2018: Dual monitor desk mount recommendation for thicker desk? Dec 27, 2018: Almost finished with my homemade desk setup! Jan 16, 2019: Finally got a dual monitor mount. So happy with the extra desk space for sure. Jan 23, 2019: Tried to keep it as minimal as possible. Any recommendations? Jan 25, 2019: Suggestions for a dual arm monitor mount? Jan 29, 2019: Joining the Alex/Karlby family. About 90% completed. Jan 29, 2019: Good quality Dual Monitor Arm? Feb 11, 2019: Where to buy a monitor stand? 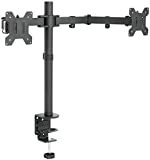 Feb 13, 2019: Looking for a Dual 24" Monitor Mount on a budget. Doesn't need to be fancy, just well built. Feb 20, 2019: Moving over from console, first time gaming build. $2000-$2250 budget. Mar 12, 2019: Best dual monitor stand/arms? Mar 13, 2019: Another picture. Tell me what you think! Mar 21, 2019: Can I use a shim to align a table lip for a c-clamp monitor mount?